This prize-winning maker produced a striking duo of highly sculpted Persian-style folders â€” the larger auto is elaborately decorated; the smaller conventional-fold imitates the autoâ€™s design features. The auto releases with a Diamond-cabochon; the manual opens with a Garnet-cabochon thumb-stud. Both are liner-locks. The handles have carved scales of Premium Mother-of Pearl, front & rear bolsters of heat-blued Damascus adorned with Rubies and 24K Gold, finished with sculpted Gold lanyard-loops. Appropriately crafted liners surround the back-spines that are inlayed with Rubies, Abalone, and Gold medallions. 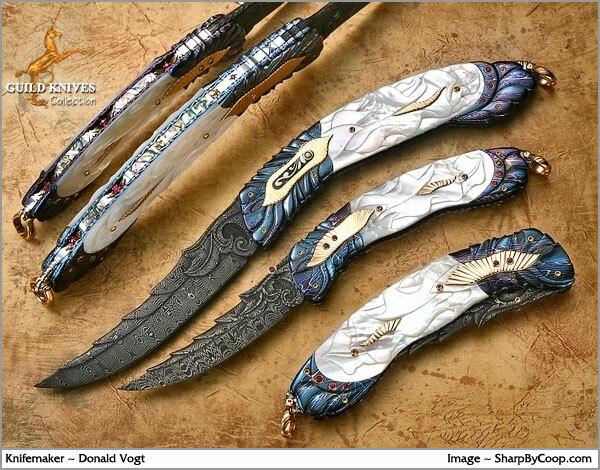 The sculpted and engraved Damascus blades are a sight to behold. The smaller knife replicates the larger. This duo displays the superb artistry of their splendid creator.